Saturday, February 25, 2011, @ 7:00 p.m.
“IF a Tree Falls: A Story of the Earth Liberation Front” tells the remarkable story of the rise and fall of this ELF cell, by focusing on the transformation and radicalization of one of its members. And along the way it asks hard questions about environmentalism, activism, and the way we define terrorism. Drawing from striking archival footage — much of it never before seen — of dramatic arsons, and intimate interviews with ELF members and the prosecutor, “If a Tree Falls” explores the tumultuous period from 1995 until 2001 when environmentalists were clashing with timber companies and law enforcement. A Q&A and discusion will follow the film. Hollywood Reporter, FEINBERG FORECAST: Scott's Final Projections for the 84th Academy Awards, Feb. 19, 2012, Prediction for BEST DOCUMENTARY FILM (FEATURE): 1. If A Tree Falls: A Story of the Earth Liberation Front: "This wide-open race ... will go to Marshall Curry’s polished, even-handed look at “eco-terrorism,” a subject of the same social scope and significance as most previous winners." Voter March blog, Academy Award for Best Documentary: Our Pick: If A Tree Falls,, Feb. 19, 2012, "Time Magazine chose "The Protester" as Time Person of The Year. We believe that this year's winner of Best Documentary will be the film that has as its central focus, The Protester...These environmental protesters, like many of the Occupy Wall Street protesters, are pepper sprayed while they are engaging in nonviolent direct actions. Similar to how law enforcement destroyed the Occupy Wall Street encampments, we see how the Park Rangers destroyed the barricades and tents of the environmental protesters who were tree sitters protecting the ancient forests in Oregon... "If a Tree Falls: A Story of the Earth Liberation Front" is our choice and prediction for an Academy Award for Best Documentary Feature for 2012, because it is a social justice film that documents the lessons of history, as we grapple with the current developments of The Protester." A donation of $5 is suggested. Epifaneo Collective is affiliated with I.N.N. World Report, a not-for-profit alternative media organization. For over 10 years, we have been supporting the activist community through broadcasts, film screenings, speaker events, and special events. Time Magazine chose "The Protester" as Time Person of The Year. A historical perspective of the protester was given, up to the more current developments in Egypt and Tunisia, to the Indignados in Spain to the Occupy Wall Street movement that spread from New York City to every city in the United States and throughout the world. We believe that this year's winner of Best Documentary will be the film that has as its central focus, The Protester: "If A Tree Falls: A Story of the Earth Liberation Front," by Director Marshall Curry and Co-Director, Sam Cullman. The title "IF A Tree Falls" has a double meaning. On the one hand, we see the pictures of beautiful trees from ancient forests being cut down by lumber companies. On the other hand, we also see how environmental protesters experience the adage "if a tree falls in the woods and no one is around to hear it, does it make a sound?" These environmental protesters, like many of the Occupy Wall Street protesters, are pepper sprayed while they are engaging in nonviolent direct actions. Similar to how law enforcement destroyed the Occupy Wall Street encampments, we see how the Park Rangers destroyed the barricades and tents of the environmental protesters who were tree sitters protecting the ancient forests in Oregon. At the same time, the film achieves its purpose as a well balanced documentary by giving equal time to the viewpoints of the owners of the lumber companies who were targeted by the environmental activists, as well as law enforcement who vigorously pursued the arsonists. We gained firsthand insight into the methods that law enforcement uses to turn criminals into informants and to coerce plea deals. Finally, we see how the environmental protesters are branded "Eco-terrorists" and subjected to enhanced prison sentences. While they undeniably committed criminal acts of arson and tremendous property damage, we are left wondering whether these protesters are really "terrorists." 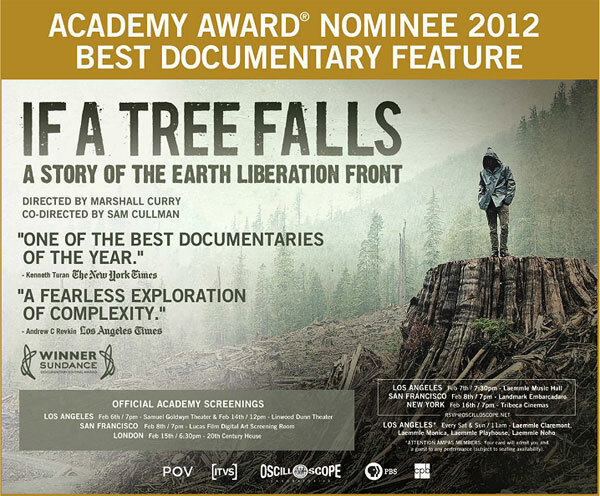 "If a Tree Falls: A Story of the Earth Liberation Front" is our choice and prediction for an Academy Award for Best Documentary Feature for 2012, because it is a social justice film that documents the lessons of history, as we grapple with the current developments of The Protester.